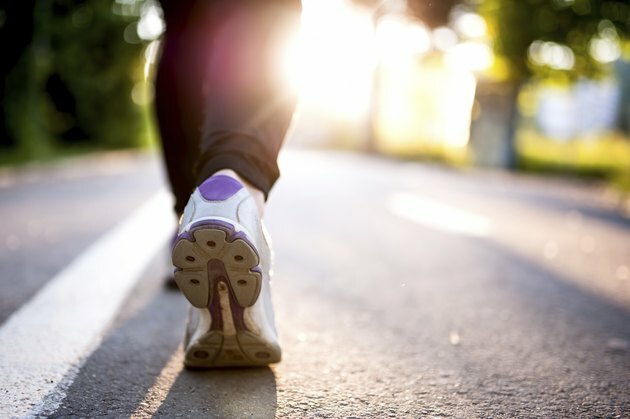 Aerobic activities like walking are an essential component of a good health plan. But you my be surprised at just how much time you need to spend walking to get the full benefits of the exercise. There are different walking recommendations based on your fitness goals. Pick the plan that works for you and get walking to get fit. At the very least you should get 150 minutes of moderate-intensity aerobic exercise, like walking, per week according to the Centers for Disease Control and Prevention. That's 2.5 hours worth of exercise over the course of a week. That might seem like a lot, but it's a manageable amount of time when you break it down. For instance, you can achieve this by walking just 22 minutes per day if you walk every day. If you were to talk just five days per week you would need to increase your workouts to 30 minutes. If you want to get maximum health results, then you need to increase the time you spend walking. For the most benefits, the CDC recommends getting twice as much exercise -- 300 minutes of moderate-intensity exercise per week. That works out to about 44 minutes of walking per day if you walk every day, or an hour of walking if you take two rest days per week. If maintaining a healthy weight is your aim, then you should know that the American College of Sports Medicine recommends getting 150 to 250 minutes of moderate-intensity aerobic exercise per week, such as walking. According to the ACSM this amount of exercise is also appropriate if you're looking for modest weight loss. But if you're looking for significant weight loss, you'll need to increase your walking; the ACSM recommends getting 250 weekly minutes or more of moderate-intensity aerobic exercise for significant weight loss. Always talk to your doctor before you start an exercise program, even one as simple as adding walks to your weekly routine. Be aware that walking isn't your only option. You can substitute other moderate-intensity aerobic exercises like playing doubles tennis or riding a bike at a leisurely pace. You can also include vigorous-intensity aerobic exercises like running or swimming laps. A single minute of vigorous exercise is equal to two minutes of moderate exercise.